Home Unlabelled Who will save Njoroge’s sh. 5.5m investment from the auctioneer’s hammer? Who will save Njoroge’s sh. 5.5m investment from the auctioneer’s hammer? Peter Njoroge with his mother Jane Njeri during the interview where he said that his KES. 5.5m investment is about to be auctioned. Anyone who is familiar with Thika’s Manchester Sacco stage near Arcade will not have missed his face. He is always there working with other crew to manage the affairs of the route. Yes, we are talking about 33 year-old Peter Njoroge who for quite a long time has been a tout at the stage. Njoroge, who is the first born in a family of four, became a darling of the Sacco leadership some years back due to his frequent visits to their terminus and admiration of their crew. With time, he was accepted into the crew due to his desire to assist passengers access their fleet of buses and matatus. 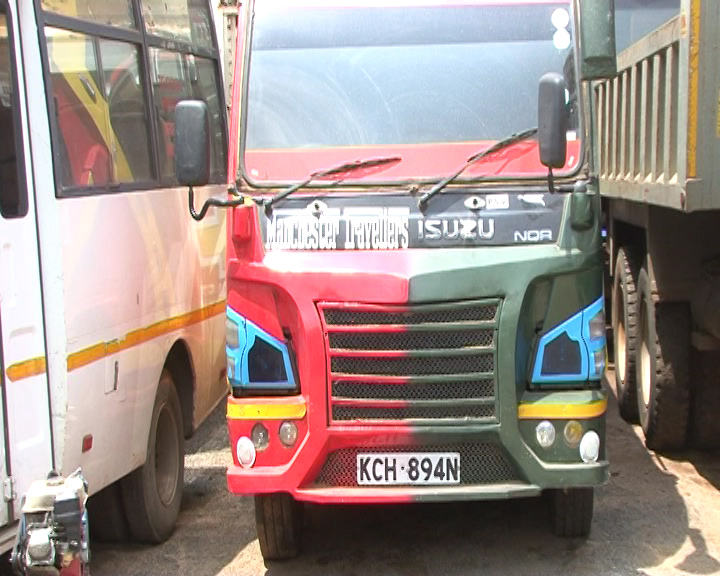 “The directors instructed our fleet manager to compel every bus to pay KES. 20 to Njoroge’s upkeep daily, consequently opening an account for him. He was eventually able to save about KES. 400,000,” explained Nicodemus Gatogo the Sacco Chairperson. After talking to this young man, the directors decided to assist him realise his dream of owning his own bus. They marshalled the support of well-wishers and managed to raise over Sh1.2 million which they handed over to the bank, as surety. Early this year, Njoroge’s dream came true and he became a proud owner of a KES. 5.5 million 33-seater minibus. His mother Jane Njeri was forced to auction their family land in order to fix it with modern music and graffiti decor before plying the Thika–Nairobi route, earning him a daily income of between KES. 5,000 and 8,000. Unfortunately, due to unhealthy competition from existing stakeholders and constant harassment from traffic police officers and Nairobi County Askaris, the bus was slowly driven out of business making it hard for Njoroge to service his KES. 176, 000 per month loan. Attempts by the directors to salvage the situation has hit a snag since majority of them are suffering the same fate. “The PSV commuter business has over the last one year suffered a big blow following the introduction of 19 seat capacity matatus popularly referred to the ‘high-roof nganyas’ notwithstanding the tough competition by a rival saccos who ferry commuters at a throw away price thus rendering us financially incapacitated,” says Gatogo. The Sh5.5 million bus that was reposed by auctioneers after Njoroge defaulted payment. Gatogo claims that that most of their buses have been grounded with others already repossessed by auctioneers after they also failed to service their loans. Njoroge’s mother fears the worst as her son developed signs of acute depression and cries himself daily. She is worried that if left alone, Njoroge might attempt suicide, forcing her to abscond all other chores to monitor him throughout the day. She narrates how her distraught son occasionally shows her President Uhuru Kenyatta’s portrait that he has saved in his phone, hoping that one day, the head of state will come to his rescue and redeem his bus from the hands of the auctioneers and the Bank. Njoroge is appealing to anyone who can assist him get to the president, Kiambu Governor Ferdinand Waititu, Thika Town MP Patrick Wainaina or Kiambu Women Representative Gathoni Muchomba to help him do so in order to salvage his dream. Njoroge is mentally retarded, born with both physical and mental challenges as well as dumb.